Chris Hemsworth has a daddy dilemma. In a Monday appearance on The Ellen DeGeneres Show, the 32-year-old actor talks about his young daughter, India Rose, and her envy of her younger twin brothers, Sasha and Tristan. “She came to me the other day and she was like, ‘Ya know, Papa, I want one of those things that Sasha and Tristan have.’ I’m like, ‘What do you mean?’ She was like, ‘Ya know, the things in between the legs that you have,’ ” Hemsworth recalls, noting that he grappled with how to handle the situation. 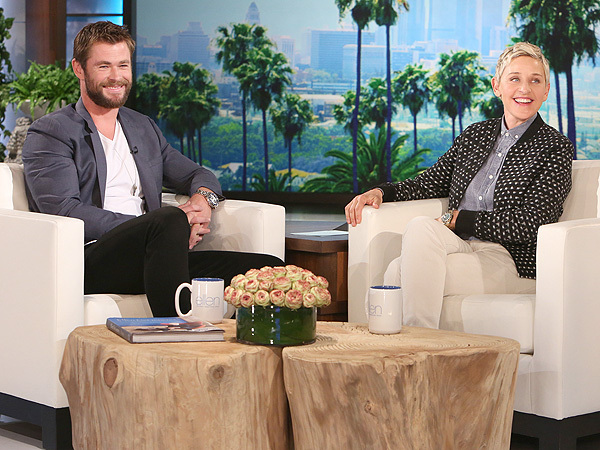 The studio audience and the host, Ellen DeGeneres, erupts in laughter then applauds when Hemsworth recalls his response to his daughter. “I was like — she’s 4 — ‘Ya know what, you can be whatever you want to be.’ And she goes ‘Thanks, Dad!’ Runs off to the playground and that was it,” the actor says. Hemsworth also got the chance to personally thank a boy scout who found the actor’s lost wallet at a restaurant in a “rough” neighborhood and mailed it back to him. “When I found out it was yours, I looked up at my mom and said ‘Mom! Do you know who this is? We found Thor’s wallet!’ ” Tristin Budzyn-Barker, 17, told Hemsworth. Not only did Hemsworth let the teen keep the cash in the wallet, the actor also wrote him a thank you letter to help him become an Eagle Scout. On top of that, DeGeneres and Shutterfly rewarded Budzyn-Barker with $10,000 for his college education after learning his family had sold some of their horses to pay for his tuition.